.Today, on Jonas Salk's birthday, I read in the NPR blog Goats and Soda, that we're almost free of this scourge. The two scientists who developed vaccines against polio, Jonas Salk and Alfred Sabin, gave mankind the tools, and several others put them to good use. Be sure to check out Jason Beaubien's article and the amazing graphics showing poliovirus cases dropping across the world. 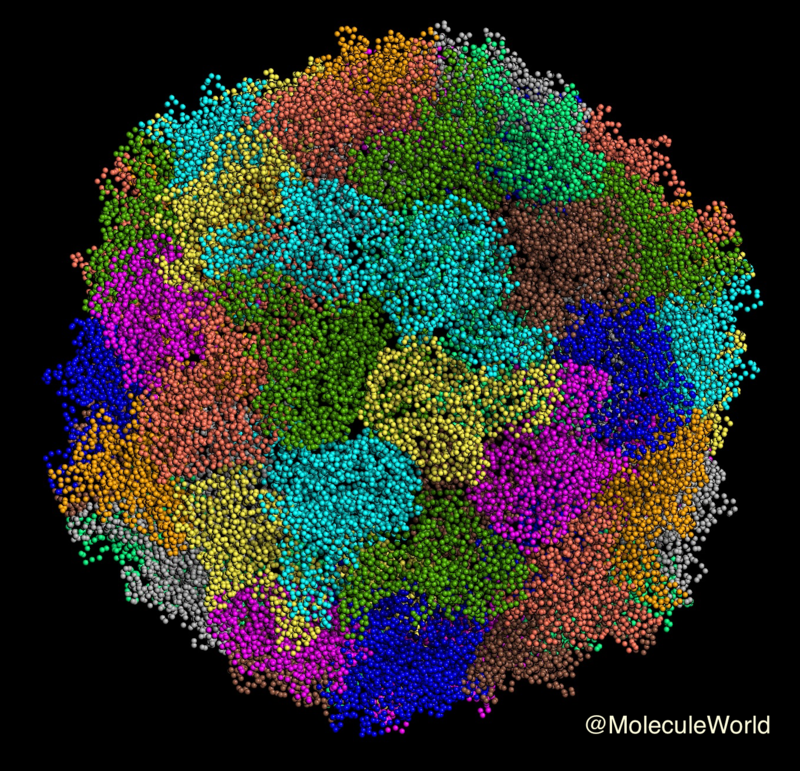 Since we have the luxury of distance, vaccines, and molecular modeling apps, we can explore the scary poliovirus from the safety of a phone or iPad. The way that I like to explore molecule models is to view a structure with different coloring styles and drawing styles and see if I can find patterns. 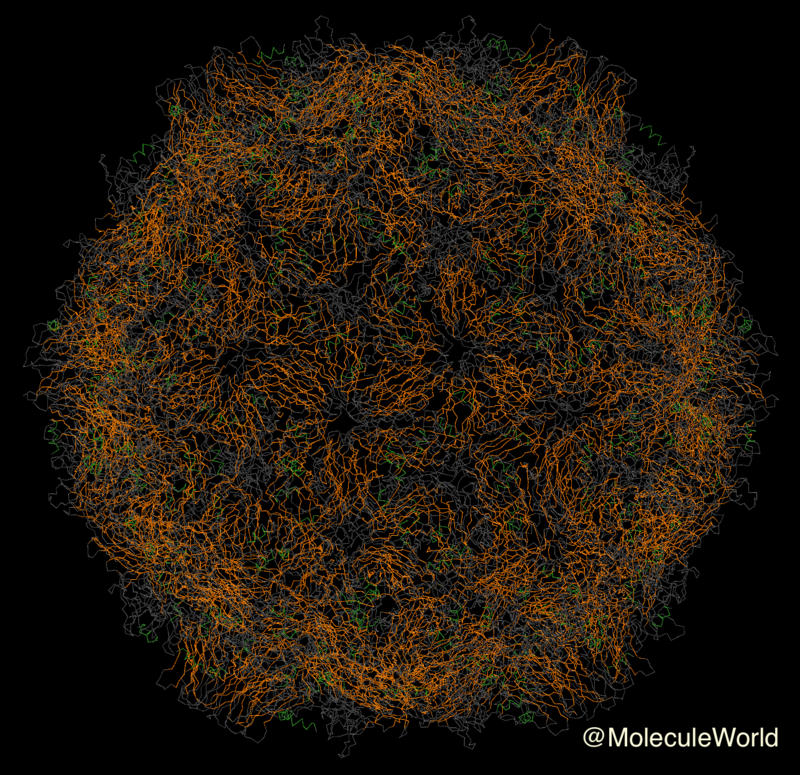 To explore poliovirus, I opened Molecule World** and downloaded structure 1XYR (Bubeck, et. 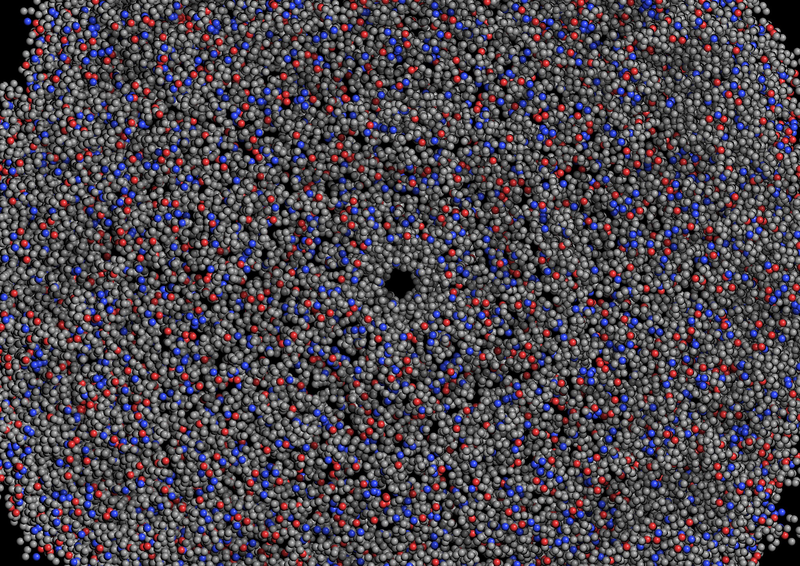 al) from the Molecular Modeling Database (MMDB) at the NCBI. The 1XYR model is from a form the virus takes when it's about to enter a cell. It was obtained through cryo-electron microscopy. 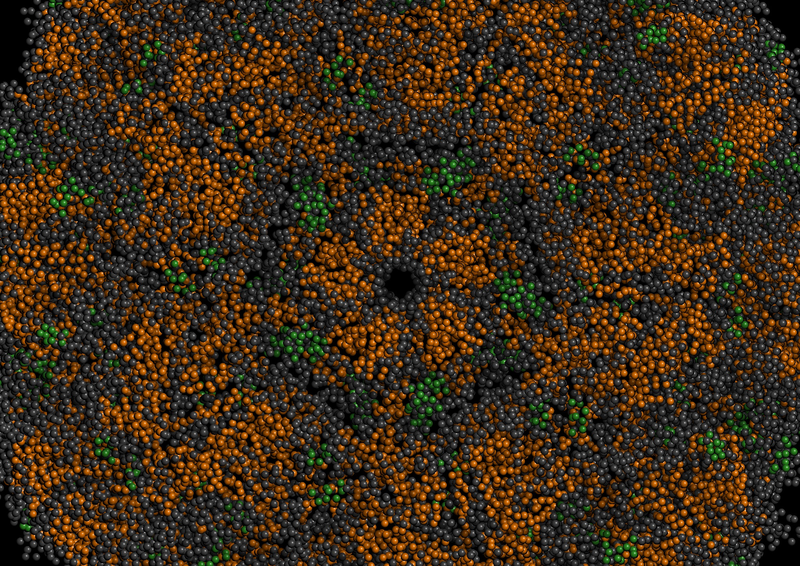 In the first image, each protein in the poliovirus capsid is shown in a different color. The resolution isn't great, because electron microscopy can only do so much, so the structure model is built from the alpha carbon backbones of these 420 proteins. In the image below, I changed the drawing style to tubes and applied secondary structure coloring to make the next image. Beta sheets are shown in orange and they make some interesting patterns on the surface of the capsid. I also found, when using a neutral color and spinning the capsid around, that there appeared to be some kind of ring or pore in the structure. In the image below, I used a spacefill drawing style, colored by charge, and put the ring in the center. The amino acids around the "opening" are grey, showing they're uncharged. The images below that show beta sheets in the region around the ring and in residue coloring, the residue color key shows there are leucines, asparagine, and glycine. I'm not sure what this pore or ring structure means for the virus, but for me, it means I'll have to read the paper and find out. 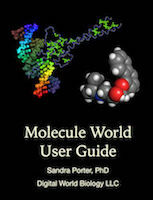 ** I used the iPad version of Molecule World. I think Cn3D might work, too, but I had some problems. 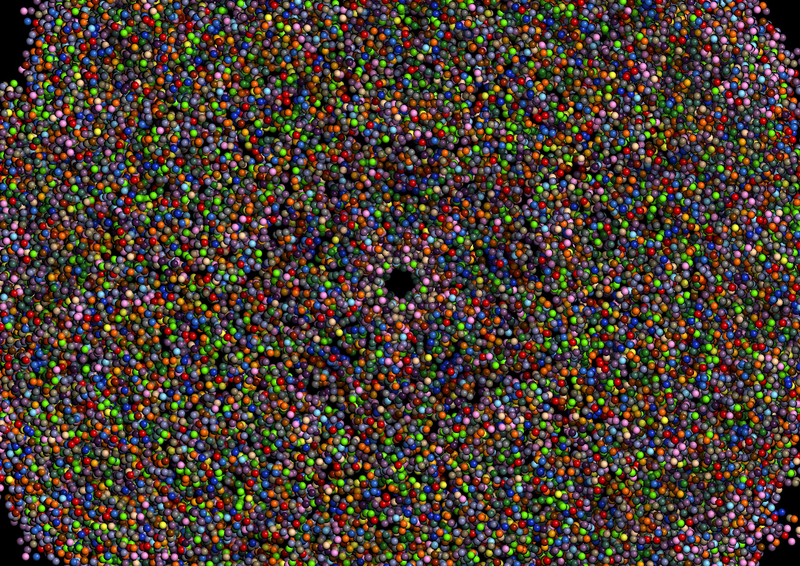 1XYR can also be viewed with the Molecule World for iPhone, but the screen will be black when the structure is downloaded. Change the viewing mode to spacefill and you'll see the structure appear. 1. Bubeck D, Filman DJ, Cheng N, Steven AC, Hogle JM, Belnap DM. The Structure of the Poliovirus 135S Cell Entry Intermediate at 10-Angstrom Resolution Reveals the Location of an Externalized Polypeptide That Binds to Membranes . Journal of Virology. 2005;79(12):7745-7755. doi:10.1128/JVI.79.12.7745-7755.2005. 2. Madej T, Lanczycki CJ, Zhang D, et al. MMDB and VAST+: tracking structural similarities between macromolecular complexes. Nucleic Acids Research. 2014;42(Database issue):D297-D303. doi:10.1093/nar/gkt1208.